This is a guest post by Jonathan Hoffman. On 31 October – over three weeks ago – I was invited to debate the topic of “What is the best way to advocate for Israel on campus?” with Dan Sheldon, the Campaigns Director of the UK’s Union of Jewish Students. I won the toss and spoke first. I sat down to listed to Dan Sheldon’s speech. I was expecting a reasoned response. What I was not expecting was what happened. I counted twelve falsehoods and/or defamations about me. Eventually an apology was forthcoming, after the JC published an editorial calling for one and some 140 people signed a petition calling for the same thing. The JC on Friday (p5) had an article by Jessica Elgot headed “Hoffman Gets UJS Apology”. It included the text of the apology which is on the UJS website under the somewhat odd heading “Dan Sheldon’s reflections on this week’s events”. The text of the JC article follows. (It was not published online so cannot be linked to or seen by those who do not or cannot buy the paper copy of the JC). UJS Campaigns Director Dan Sheldon has apologised for linking Zionist Federation co-vice-chair Jonathan Hoffman with the English Defence League. Mr Sheldon clashed with Mr Hoffman during a heated debate hosted by Leeds JSoc two weeks ago, over UJS’s “Liberation” campaign. Mr Sheldon claimed that Mr Hoffman was “happy to demonstrate side-by-side with members of the EDL Jewish Division” during counter-protests at the Ahava store in Covent Garden. In emails seen by the JC, Mr Hoffman contacted the police in August 2010, stating he “did not welcome the EDL” who had been at the past two demonstrations outside Ahava. He requested a separate “third pen” for EDL supporters, but the police refused to provide this. On a JC blog Mr Hoffman said: “My record of fighting the far right is impeccable: witness my activism against Irving and Griffin when they were invited to the Oxford Union Society in 2007. Mostly the smears are from enemies of Israel and so they are in some sense a badge of honour … but for them to be repeated by those in positions of responsibility in the Jewish community is completely beyond the pale.” The full text of Mr Sheldon’s speech has been removed from the UJS website and Mr Sheldon has posted an apology which says: “I stated that Jonathan Hoffman was ‘happy to demonstrate, side by side, with members of the EDL’s Jewish Division’. The wording of this apology was not agreed to by me. I had sent a draft of an apology to UJS but it was ignored. The apology (“…. since voiced…”) makes it sound like I only voiced my opposition to the EDL after the debate on 31 October. That is demonstrably false and Dan Sheldon could have found that out if only he had done a modicum of research and not swallowed uncritically such defamations by the enemies of Israel. …..there was some crossover between the BNP and the EDL and that the EDL sometimes intimidated Muslims and that both these are reprehensible. And there was not just one instance of defamation in Sheldon’s speech. There were twelve. Just one of them was that I “wear crash helmets to peaceful pro-Israel demonstrations”. I racked my brain about that one, since I do not even own a crash helmet. Then I remembered. During Gilad Shalit’s captivity the ZF used to organise vigils at the Red Cross office in London. I remembered that I had cycled to the last one, on a Barclays Cycle Hire bicycle. And guess what …. I wore a cycle helmet and since there was nowhere to leave it safely at the vigil, I wore it. Aside: Mr Sheldon told the audience, “This is a man who has called for a boycott of the Guardian”, as if such a proposal was a source of shame! Well, I am happy to acknowledge that one as being true – and to say that the idea that this detracts from my credentials as an Israel Advocate is ludicrous. What is the best way to advocate for Israel on campus? In asking this question we are in the realm of the social sciences. In the physical sciences we can conduct experiments. Finding the best breaking system for an express train, or finding the best treatment for tetanus, are both possible through experiments. In the social sciences the nearest we can get to experimentation is to set up a focus group. To the best of my knowledge there has never been a focus group on Israel advocacy on campus. So one has to look at the evidence. What I will argue is that the evidence suggests that campuses are a centre – if not the centre – of the monstrous and remarkable inversion of reality whereby Israel has become a pariah state because of its determination to defend itself. (Of course they are ably assisted by some parts of the Press in particular The Guardian, Channel 4 and the BBC). I argue that by its failure to take on the delegitimisers on campus full-square, UJS has allowed them to gain much more traction. The Reut Institute is a national security think-tank in Israel. In a report published last year it said that London was the ‘hub-of-hubs’ of the delegitimisation network. Much of the delegitimisation activity takes place on university premises. I know because a small group of us go to hostile meetings and we have been to many on London campuses. We hand out leaflets, make a fuss and then blog what happens at the meetings, on the basis that “sunlight is the best disinfectant”. (Some community leaders say “don’t give it the oxygen of publicity” but in my view that is a totally misguided line to take). We have been to Israel-bashing meetings at Goldsmiths, LSE, UCL, Imperial College and SOAS. Only a week ago tonight we were at a meeting at SOAS to discuss boycotting Israel. Steve Hedley – Bob Crow’s right-hand man at the RMT trade union – told me at that meeting that I was one of the ‘Chosen People” (this phrase used in an abusive manner is a favourite of antisemites: of course the phrase “Chosen People” in the Bible clearly means chosen for responsibilities and not chosen for privilege). Then he referred to “your friends in the media” (the trope that Jews “control the media” is beloved of antisemites – it appears of course in that well-known antisemitic forgery “The Protocols of the Elders of Zion”). But it’s not just London campuses where delegitimisation meetings under the auspices of Palestine Societies are taking place. It’s happening at most British Universities. I can give you plenty of examples. Here’s one that’s coming up. This time next week Norman Finkelstein will be speaking on this campus in Leeds. The following day he moves to Manchester, on Wednesday to Nottingham, on Thursday to Birmingham and on Friday to Logan Hall, London. Norman Finkelstein is what I call a ‘renegade Jew’ –the phrase ‘self-hater’ – while probably true – is not one I use. Norman Finkelstein supports Iranian and Hizbolla terrorists and thinks that Jews exploit the Holocaust for financial gain and for propaganda reasons. He even exploits the Holocaust suffering of his parents to delegitimise Israel. He is invited here by one of the pro-Palestinian organisations. Why do the PSC, the Islamists and the Left organise so many anti-Israel events on campuses? Simple. Because they want to recruit students. It’s not for nothing that Israel has been called “the recruiting sergeant of the Left” (by Robin Shepherd in his great book “A State Beyond the Pale”). The Palestinians have long been seen by the Left as an instrument of revolution in the Middle East. Since the collapse of Communism, Israel as a whipping-boy has become even more important to the cause of the Left. Demonisation of Israel is now the glue that holds the Left together. To persuade students of their cause, they lie through their teeth. They make false ‘apartheid’ analogies about Israel. They lie that those who defend Israel from their calumnies do it by accusing Israel’s detractors of antisemitism. We could argue about the best way to advocate for Israel at these meetings. Should you stay silent and hope to be called on in the Q+A, or should you heckle and interrupt, in the knowledge that only people hostile to Israel will be called upon to ask a question? (My strong preference is to heckle and interrupt, because the chance of being called is very low). One thing I hope we can agree on is that defenders of Israel should be outside the meetings before the start and after the end, handing out fliers which tell the truth. And that they should make themselves available when the meetings are over, to talk: sometimes there is just one person who mistrusts the certainty of what he has heard in the meeting and wants to know more. Some of my biggest successes have been in such 1-on-1 discussions after meetings. Yes we could argue about the best way to advocate for Israel at these meetings. But we surely all agree that it is folly for Israel advocates to stay away from these meetings completely. Because that leaves the door wide open for a new generation to be indoctrinated by the delegitimisers. But in many cases that is what UJS is doing – staying away and standing aloof. Not all cases. There have been some great victories and I have been the first to acknowledge them. Getting Birmingham students to vote to accept the EUMC Definition of Antisemitism in May 2010 was a great victory. So was the defeat in January 2008 of a motion at LSE calling for a boycott of Israel and calling Israel an apartheid state, raised at the student union general meeting. But against this have been some horror stories. When Danny Ayalon spoke at the LSE in October 2009, we knew there would be a hostile demonstration so we organised a counter-demo, to support Ayalon. It was in Lincolns Inn Fields which is a public street. We asked Ben Grabiner – who was at that time head of the LSE I-Soc – if he would put the word round his members to join the counter-demo. We were horrified by the response. He did not get back to us but the then UJS Campaigns Officer did. She was furious that we had dared organise a demo to support an Israeli Minister. She felt it would just be provocative! She tried to tell us it was an internal LSE matter and that UJS should handle it. It was not ‘internal’, Ayalon happened to be speaking at LSE but that was it. And our proposed demo was in the public street. So we held the line. She then called the Chairman of the ZF to try to get him to put pressure on me. Ben Grabiner sent a text to his members warning them not to join our counter-demo. He said – absurdly and slanderously – that it was being organised by a ‘right wing organisation’. I know because one of the LSE students joined our demo despite being warned off by Ben Grabiner, and showed me the text. More horror stories. In February 2010 Cambridge Israel Society capitulated to pressure and cancelled a meeting with Benny Morris on the grounds that he is a racist. Benny Morris is no racist. In April 2010 under pressure from the Federation of Student Islamic Societies, UJS cancelled Douglas Murray at short notice, having invited him to speak in Gateshead. Douglas subsequently wrote a blog entitled “How to lose friends and alienate people. A lesson from Islamist-cowed Jewish students”. And most recently there was UJS’s proposal to give out Palestinian flags. No, no, no. The Hamas Charter urges the genocide of Jews, the Palestinian Authority does not recognise Israel’s right to exist as a state grounded in Judaism. Mahmoud Abbas, the President of the Palestinian Authority, wrote a doctoral thesis in which he described the Holocaust as “the Zionist fantasy, the fantastic lie that six million Jews were killed.” To have the Union of Jewish Students giving out the Palestinian flag is something that most Jews would regard as obscene. And I have been to many hostile meetings on campus where there is no sign of Jewish students whatsoever. The reticence to engage with the Israel-bashers is, I believe, a contributory factor to the rise in antisemitism on campus. Antisemitism includes the vilification of Israel – see the EUMC Definition – if it is expressed in certain ways. To say that Israel is a racist state is antisemitic. So is holding Israel to higher standards than other nations. So is making Nazi comparisons when speaking about Israel. So is holding Jews collectively responsible for Israel’s actions. The recent JPR Report said that just over two out of five (42%) respondents had experienced an antisemitic incident since the beginning of the academic year (7 months at that time). Confining the sample to respondents who were ‘very positive’ about Israel takes the figure up to 48%. Almost one in two? – That is simply not acceptable. ‘Anti-Israel sentiment at university’ (38%) as they are about ‘Passing exams’ (76%) – the obvious implication being that worries about antisemitism are minor. Worrying about exams is natural. Worrying about antisemitism is not and must never become so. So what kind of UJS do I want? I want a UJS that is proud, not cowed. I want to see Jewish students going in to hostile meetings and making their presence felt, heckling if necessary. I want to see them handing out fliers before and after a hostile meeting so that students who are new to the subject can get the truth – to offset the lies they are fed at the delegitimisation meetings. Of course I want to see proactive events as well as reactive activities. Proactive events celebrating all aspects of Israel, from science through culture through food through openness and tolerance. The ZF can – and does – help, providing speakers like Khaled Abu Toameh – an Israeli Arab journalist – for campus meetings. And proactive events putting Israel’s case: explaining why the security fence is necessary and why Israel had to do ‘Operation Cast Lead’ in Gaza three years ago. StandWithUs and Britain Israel Coalition are also great pro-Israel organizations that are active on campus. If any of you can get to London on Sunday 6th November, please go to the StandWithUs Conference with the Ambassador and Louise Mensch MP. Then on December 11th it’s the ZF Advocacy Day. Every lie about Israel has a killer response founded in truth. If you want me to give examples, ask me in the Q+A. (I hope to soon publish a pamphlet of lies and how to respond to them). Jewish students are intellectually inquisitive and seek the truth. Yet when it comes to rebutting lies about Israel they are strangely reticent. I don’t understand why. 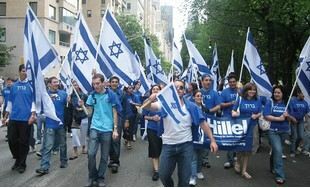 Advocating for Israel is cool, very stimulating intellectually and can be incredibly rewarding personally. It has made me some great friends. I think it’s the duty of Jewish students to be ambassadors for Israel on campus and to rebut the lies, but it’s a very pleasant duty – it’s fun, too. I really don’t see why a Jewish student should not want to be an advocate for Israel. To say that Israel is a racist state is antisemitic. Not necessarily. Plenty of people call e.g. the US or UK racist states, after all. the obvious implication being that worries about antisemitism are minor … Worrying about exams is natural. Worrying about antisemitism is not and must never become so. But who is implying such a thing?? And besides – you’ve turned “anti-Israel sentiment at university” directly into “anti-Semitism”. I am curious to know. Do you agree the EUMC’s broad definition of anti-semitism? You know full well the difference between anti-American sentiment and anti-Israel bashing. They are not equivalent as you egregiously try to suggest. And Jonathan Hoffman is not turning anti-Israeli sentiment directly into anti-semitism. Much so unfair anti-Israeli sentiment IS anti-semitism by reason unfair double standards. Much so unfair anti-Israeli sentiment IS anti-semitism by reason unfair double standards. I agree that is true in many cases. a) claims that “To say that Israel is a racist state is antisemitic”. b) turns the ‘Anti-Israel sentiment at university’ question in the survey into “antisemitism”. Nobody here seems willing or able to admit the simple truths in my post – or show them to be false. And I did not “egregiously” try to suggest that anti-American sentiment and anti-Israel sentiment are “equivalent”. Let’s have a bit more honesty. As for the EUMC’s “broad definition of anti-semitism”? It is broad indeed and open to interpretation (especially the “could include” qualifier). Hoffman, however, simply distorts it – as seen above. When anti-semites refer to Israel as being a racist state, they are referring to The Jewish aspect of the State as being racist. The deniability of the right of Jews to self-determination is racist. Being Jewish is something less than being, so to speak is what racists say. That Pretzelberg is what Hoffman is saying. You do not seem to follow this. Perhaps you are innocently accusing Hoffman of things that he is not saying? I dunno. Or are you saying that to say that there are racists in Israel(as there are everywhere else in the world) is not racist? Again, I dunno. I can only conclude that you are someone who likes to argue, when there isn’t much to argue about. The point we should be looking at is what is happening at colleges. Young students entering college need strong guidance. Many are not prepared for a well run campaign to villify a country that is the flagship of their own identity. To be labelled racist, supporter of apartheid policy and so on, requires those with some knowledge about the situation to support those who face this abuse and to put some lead in their pencils to challenge and persuade others not to allow this sort of stuff to go on and to tell the truth.The students entering colleges do not come in waving flags, handing out leaflets and pushing an antiPalestine campaign. It’s the other way round Pretzelberg and sometimes one has to speak up. Sounds great, how much to I get for spreading propaganda? The North Koreans, Chinese & other occupying & repressive regimes offer really good deals. I can’t believe what I’m reading about UJS. At risk of sounding all “when I were a lass…” back in the late ’80’s and early ’90’s, we were ricocheting off multiple cross-country attempts to ban J-socs and careening into the dark and hostile days of the first Intifada. Not a fun time for a Jewish Zionist student to exist at university, I’m sure you’ll agree. UJS had a strong and focused constant campaign in leading student activism against antisemitism and anti-Zionism — and any other ism that prevented identifying Jewish students from feeling comfortable on campus, regardless of how they did or didn’t choose to express themselves. From what you write, it would appear that what was the backbone of a seriously lean and mean hasbarah machine has turned to jelly, cowed by fear and unfair prejudice, and all too easily swayed by the same. I so hope this not true, and that I’m wrong. I really do. I know that the UK I left behind me when I made aliya 18 years ago is not the UK of today, but still. I agree with your premise that we should not allow such atrocious behaviour to pass without comment and/or demonstration, because to do so is to negate the truth of the situation, so often smeared into falsehood and extinction, by those who would besmirch anyone and everyone who believes in the Jewish right to self determination — however they express it. Mob rule in the UK. Lower the Union Jack and put it on the shelf. Ah, the EUMC working definition. That old canard. And your own definition of “anti-Israelism” is … ? Contributing to the effort to stop Israel from existing. That includes talk of “settlers” meaning Jews and talk of “occupation”. Certain Ha’aretz writers refer to “settlers” and “occupation”. Does that mean that Ha’aretz is guilty of “anti-Israelism”? That would in turn make the paper anti-Semitic by your definition. You might want to rethink your comments above. How does talk of “settlers” (i.e. in the West Bank, not Israel) contribute to “the effort to stop Israel from existing”? And the West Bank is indeed “occupied”, is it not (even if there are in part justifiable reasons for that)? Pointing these things out is not – necessarily – anti-Semitic, is it?? Are you referring to Jordan’s illegal occupation of – and renaming of – Judea and Samaria? Jews are not settlers in the land designated the Jewish national home. When it comes to defaming Jews, the Palestinians are pisherkehs next to Ha‘aretz. Even at that we are better than they are! Simply put (if it is ever possible to put things like this simply): Before Israel, we had antisemitism. Since Israel we have “new” formula Antisemitism Plus with vitamin Israel added. The only canard Hebroni is that your type like redefine terms to suit your perverse agenda. Nice try. The Israelis NOT being the unarmed Jews of WW2 national Socialist infested Europe. The working definition, in its orginal form (before it was tampered with by the AJC), was perfectly adequate. But then those with a perverse agenda (Israel at all costs) had to introduce their tuppence worth to make it ridiculous. Hebroni, the definition if you can read,is not one for “Israel at all cost” – only in so far as it states that denying Jewish rights to self-determination and in context, is antisemitc and applying double standards eg UN HRC resolutions tend to be weighted in favour of bashing israel while North Korea barely gets a mention. That sort of thing is symptomatic of anti-semitic thinking and is not “tampering”. There are plenty of things wrong in Israel and wrong from different standpoints, and plenty that is right. The reality Hebroni is that with you, it is not “Israel at all cost” being the issue but “no Israel at all costs and be damned with any definitions!” That is if definitions get in the way. Not again … Can’t you find an original smear? Which Levy do you mean?